Ah, yer making me jealous! I see the occasional old (70’s) generic folder on Portland CL, but the sellers still want more than I’m willing to pay. Nice find. And I like those brazed-on racks. I really like the grips on the blue one (possibly on the red one too it’s handlebars aren’t in the pictures) if your planning on switching them out let me know and I’ll totally buy them! I love the look of these bikes and the U frame. I’ve never been crazy about folding bikes, but these look like they would be fun to ride. Enjoy, and keep us posted. Ooh! Via a commenter on @Velouria’s recent post on the D2R Boogie: here’s a modern version of the U-frame. I’m wondering if the accessories would fit on the Twins. A front rack might come in handy! @adventure! – I think we paid $50 per bike. =D The brazed-on rack was what sold me on it, too. @mattyfu – Both bikes have those grips. I was thinking of keeping mine all original, but if either of us decide to swap the grips out we’ll let you know first! 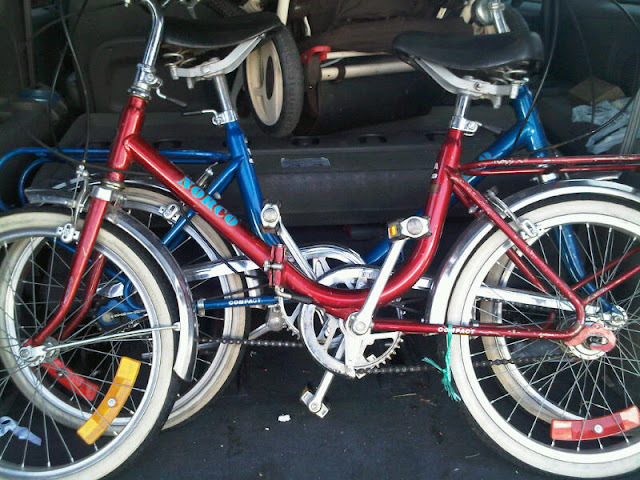 @SM – We did pump up the tires on the blue one and take it for a brief spin. It was pretty comfortable – can’t wait to have it tuned up and take it for a proper ride! $50? Sheesh. I’d be lucky to find a 70’s department store folder that looks like it was stored underwater for that price in Portland! We’ll have to have another foldy ride this year. Very, very cool. My husband purchased a Dahon folding bike for me early this fall and I love it. They make a u-frame that is really lovely but a bit more expensive than I can afford. The 1st folding bike pub crawl was a blast… I organized it and we are looking to have another one in the spring. This U frame design is very common among Euro folders and all the parts on these seem to have been made in Italy, “Brev” is short for Brevetto which means patent in Italy. The Raleigh Compact and non folding Saffron were also Italian made and my daugher’s Saffron dates to 1980. PS – The axle nuts are proprietary and you can get them at EBC or send me a note as I have some. @Sixty Fiver: the axle nuts have already been ordered from one of my enablers on eBay. =D Springtime, sweet! So I guess the foldy ride will get an upgrade to biannual? We really should get on organizing a local vintage bike get-together, too… the photos at http://www.canadianvintagebicycleshow.ca/index.html make me weak-kneed and a little jealous. We hope to make the folding bike ride a bi-annual event (at least) as there are a lot of people in the city who have developed folderitis. I have 3 folders now… a Phillip’s 20, a Raleigh 20, and a Bickerton. That Norco looks very much like my Atala, a big italian company still in bizness. I recall they are called “Graziellas” in Italy after one of the earlier producers of that design. The blue bike has a lot of the detail characteristics of my Graziella Brevetta city bike. It most likely was made by the Italian company Graziella. My other folder is a Downtube 8 speed SA fully sprung mountain bike. My previous Downtube (orange color) was stolen on Whyte at 104 St. Edmonton, a couple of years ago. Please watch for it. I acuired a “Hyda Bike” on Craigslist this past weekend and the geometry is exactly the same. Mine does not have a Sturmey Archer hub, instead it has a freewheel hub. Also the brake handles are integrated into the handlebar, that is, the base pivot is brazed/welded in, not clamped on like most bikes. $60 for it and a Dahon with a few missing parts..
Hi! How did you date these as 1983? Your bikes have identical decals to my Norco Avanti and I’m trying to figure out the date.